Well, we made it pass Valentine’s Day. And I was nice on Valentine’s Day for once! And considering I enjoy nothing more than raising the ire of the deities of love and romance, that is a borderline miracle for me. And what do I get for all of my efforts and restraint? Well, a vampire BL VN to start off with…pretty sure that’s the dictionary definition of ‘karma’. The graveyard shift at a dingy diner in San Francisco — that’s where MC’s story begins. It’s just another normal night, or at least it seems to be. …That is, until a certain mysterious customer stops by, bringing the dangerous attention of a few people with him. When it rains, it pours, and suddenly MC finds himself in the middle of a war he didn’t even know existed… between vampires. Let’s all please refrain from all Vampire, Urban Fantasy and Young Adult fiction jokes until we find out whether or not this VN is any good…although a few just rushed to the front of my head there so, what can you do? Red Embrace is available on both Steam and Itch.Io for $4.99. Hold on…let me get my mouth guard in place. This isn’t going to be the last romance game we cover this week, after all. The archangels of Heaven are planning their first miracle on Earth in over four hundred years. In order to succeed, they need your help! Of course, humans can’t visit Heaven while they are alive, so you’re going to need some 21st-Century technology to give the angels your input. Join them in miraclr: Divine Dating Sim. If you would like to hook up with a heavenly body (no I’m not sorry because that joke is too good) then you can get miraclr: Divine Dating Sim on Steam and Itch.Io for $9.99. You and your house mates are NOT spending valentines day with a romantic dinner with that significant other – so what’s a girl to do? Party of course~ Dragging your best friend and cousin with you, you are determined to make sure that at least one of you has a blast. Valentines Otome is available on Itch.Io for free, but you can name your own price if you’re feeling generous. Mhakna and Sebiarno have seen better days. Their orphanage is run by a cranky old lady, who will turn the two into animals and sell them in the city if they do not find a foster parent by the age of 10. With a little help from a Fairy called Bell, they escape to Enles Land, a kingdom of eternal happiness for children, leaving their former lives behind. Here, they meet other children just like them. But little do they notice… something is amiss in this utopia for children. Congratulations, AID! I may not see eye-to-eye with your work, but by all accounts they’ve built their company the right way and that is to be commended in this day and age. Mhakna Gramura and Fairy Bell is available on Steam for $4.99. One of the things I do love about the visual novel medium is that there are still plenty of people who see the space as a giant laboratory. While most independent games can fit that label, we’re specifically talking about experimentation with narration rather than technical presentation or gameplay. A great example of that are several visual novel developers from European countries: We Are Muesli, Moacube, Broken Rules, etc. The Alpha Device looks to follow that trend with a game that literally fleshes out the world as you play. Beyond space, beyond reason… beyond humanity. Discover a gripping tale of a dystopian future narrated by David Hewlett, star of the Academy Award-nominated The Shape Of Water. The Alpha Device is available on Steam for free. Stepping outside of the narrative lab bubble that I like to go into from time to time, one well of inspiration we all draw from more than we care to admit are classic fairy tales. The loyalty or subversion of these classic works is as common to the growth of a writer as any other developmental tool: fanfiction, original works, etc. This is especially true to writers who don’t have the immediate wells of anime and manga to draw from: mostly certain foreign countries. This brings us to Russia. Every granddaughter goes to her grandmother’s house at least once in her life to eat something delicious and drink tea. Our protagonist is no different from a million of other girls. The only issue is that the way to her Gran lies through the dense, partially dark and from time to time dangerous woods, where it’s possible to meet someone strange, mysterious and curious. Crossroad is available on Steam for $8.99. The Great War is over, the economy is booming and jazz bars are cropping up everywhere. Welcome to Roaring Twenties! The stylish and charming Miss Phryne Fisher has just returned from a jaunt in Europe to her hometown of Melbourne, Australia. 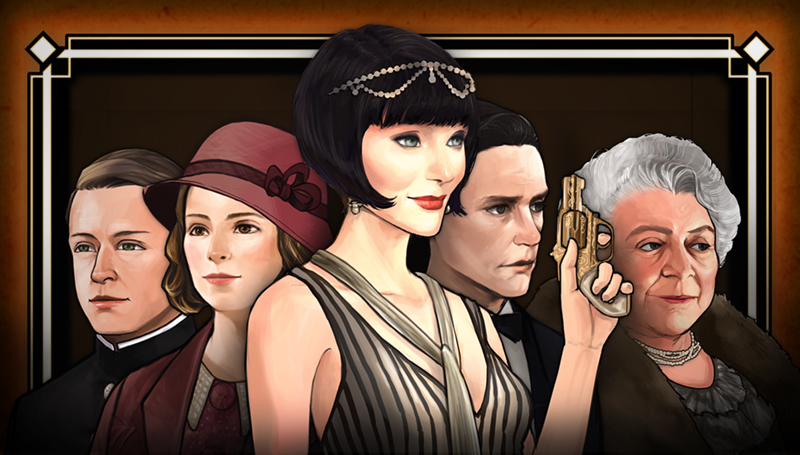 Phryne may be an heiress and a socialite, but she is also a stellar detective – as famous for flaunting the conventions of her time as she is for her gorgeous outfits and stunning sense of style. Armed with her golden pistol, razor sharp wit, and bottomless charisma, Phryne solves mysteries of every variety; kidnappings, conspiracy, and – of course- murder. Miss Fisher and the Deathly Maze is available on Steam for $7.99. With it’s distinctive style and grim sense of humor, I’m sure this one will check off a lot of boxes. Speed Dating for Ghosts is available on Steam for $9.99. That’s all for this week! JP3: OUT!